Who should carry out a racking inspection? Racking inspection legislation can be difficult to understand. As such, there are some very common violations. Violating racking inspection legislation isn’t an okay thing to do, but it is a surprisingly common occurrence. Many businesses which are otherwise run smoothly and professionally can find themselves committing a racking inspection violation not through negligence, but through ignorance. So, how can businesses avoid these mistakes? And what are the most common kinds of racking inspection legislation violations? To download your FREE Racking Inspection checklist (and get occasional email updates) sign up below! Side note: what is racking inspection legislation? Racking inspection legislation violations are dependent on the idea that a law relating to racking inspection was violated. However, the truth is that what most people consider to be racking inspection law is actually just a recommendation. Yes, these recommendations are backed up by HSE, SEMA, and the EU. What’s more, these recommendations are echoed in the CDM Regulations 2015, which is a law. Yet, the only hard piece of racking inspection legislation in the UK comes in the form of the Provision and Use of Work Equipment Regulations (PUWER) 1998. Sections five and six of this document outline the need for work equipment inspections after a system has been installed, if the system has been damaged or changed in any way, and at “suitable intervals”. This legislation is vague, but it forms the backbone of all of the recommendations HSE, SEMA, and the EU make. Without a proper framework, a racking “inspection” is really just someone looking at a racking system and scratching their head. If you don’t know what you’re looking for, there’s absolutely no use in staring at a pallet rack and expecting to find something. As such, it should come as no surprise that a kind of ad hoc process like this doesn’t stand up in a court of law as an inspection. The tragic case of Ciaran Williamson is evidence of this. The boy was crushed to death by a headstone which fell onto him. When probed about safety inspections, the council stated that they had performed them on the gravestones. However, HSE argued that the council’s “ad hoc inspections” didn’t classify as proper inspections because there was no system in place. This same line of logic can be applied to racking inspection legislation. 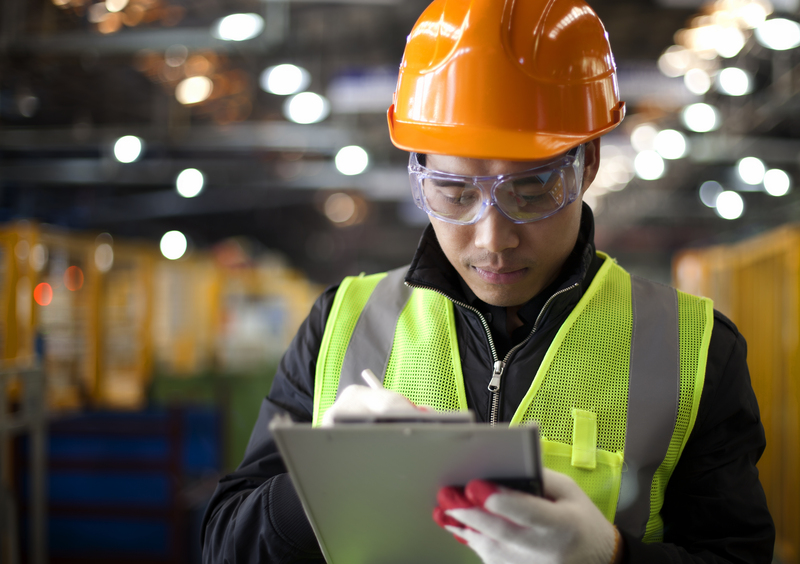 If your inspection system doesn’t include some kind of racking inspection checklist or isn’t backed up by racking inspection training, do your staff even know what to look for? How can you tell what they have looked for? And what actions will be taken if they find something? Section five of PUWER 1998 insists on a log for maintenance inspections, and this is expanded upon in HSE’s HSG76 and the EU’s EN 15635. Both recommend using a traffic light system to keep track of racking inspections. A green light means that the system is fine, an amber light means that the system is damaged enough that it needs to be offloaded and repaired as soon as possible within the next four weeks, and a red light means the system needs to be offloaded and repaired immediately. Our racking inspection training combined with our racking inspection checklist helps employees and employers to implement a racking inspection process with a traffic light system. It’s extremely common to come across a business which has never had a racking inspection. Either there is no system in place, the system in place is not followed, or the business didn’t properly understand what their duties were. Businesses with a basic understanding of racking inspection frequency might insist on the odd inspection. However, HSE’s recommendation that there should be an inspection once “every 12 months”. It’s a good rule to follow (as it helps to give a definitive answer to what a “suitable interval” is according to PUWER 1998), but it is not the same as once a year. The former would suggest that an inspection in January 2017 followed by an inspection in December 2018 is perfectly acceptable. Yet, while that is still technically “once a year” it’s not “once every 12 months”, as the two inspections are separated by nearly 24 months. “Once every 12 months” and “at suitable intervals” can be easy enough to follow, but the biggest mistake people make is ignoring the caveat in PUWER 1998 which states that work equipment should also be inspected if “exceptional circumstances which are liable to jeopardise the safety of the work equipment have occurred”. In other words, has something changed about your rack system that could make it less safe? In even simpler terms, is it damaged? If you’re not sure, it’s best to err on the side of an inspection as the law refers to something being “liable” to cause danger. The mere act of it worrying you means it’s liable. To make sure that you don’t violate racking inspection legislation, contact SEE today for racking inspection training, a SEMA approved racking inspection or a FREE racking inspection checklist. A SEMA approved racking inspector (SARI), Justin is one of less than forty SARIs to be approved by SEMA to inspect both pallet racking and cantilever racking systems. As the owner of Storage Equipment Experts, Justin delivers rack safety inspections and rack safety inspection training to businesses across the UK. Justin has also written for a variety of publications (including EHS Today, OHS Online, Supply Chain Brain, Small Business, and E27) on a variety of health and safety related topics.Justin remains committed to delivering racking inspection services to businesses across the country. So, whether your business is based in Cardiff or Carlisle, Derry or Derby, Ipswich or Inverness, Storage Equipment Experts will be there. Contact SEE today for racking inspection training from the best in the business. What Are the Repercussions of Ignoring Warehouse Risks?